Welcome to the Newport Beach Sailing School, a proud affiliate of the world-renowned American Sailing Association. We are glad that you discovered us in your search for the best place to learn how to sail in Southern California! The Newport Beach Sailing School is unique in that we specialize in private and semi-private sailing instruction off the coast of Southern California. 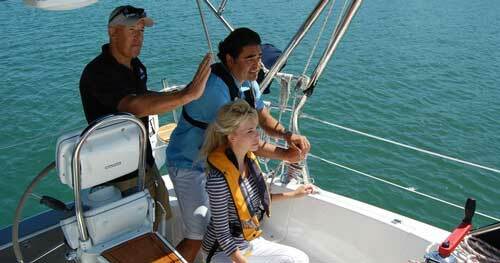 We issue American Sailing Association (ASA) student certifications for beginner through advanced classes. We have hand selected our ASA Certified Sailing Instructors and many have won the ASA Outstanding Instructor of the Year. Simply stated, you will receive some of the finest instruction at our school. Now offering a special discount for veterans and active duty military on our ASA 101 Class. Click here for details. Thousands of men and women have become knowledgeable, confident sailors precisely because of their training with American Sailing Association (ASA) sailing schools. Once you earn your ASA certifications, you will join this especially competent group of sailors who have gone on to buy a new boat, buy a used boat, and/or charter sailboats in Southern California and destinations throughout the world! The Newport Beach Sailing School is unique in that we specialize in private and semi-private sailing instruction off the coast of Southern California. Our motto is “The best value in private sailing lessons.” We are dedicated to providing highly personalized instruction, and the classes are scheduled according to your availability. We train on beautiful, coastal cruising sailboats built in 2005 or later, which means that you are learning on boats with some of the most cutting edge design, electronics, and instrumentation. We invite you to go sailing with us! Sailing is our passion and we love to teach people about this wonderful sport. With over thousands of sailing classes completed and counting, Newport Beach Sailing School is the most complete and trusted sailing school in Southern California.